Barmer Boys rock Kathputli restaurant on New Year’s! 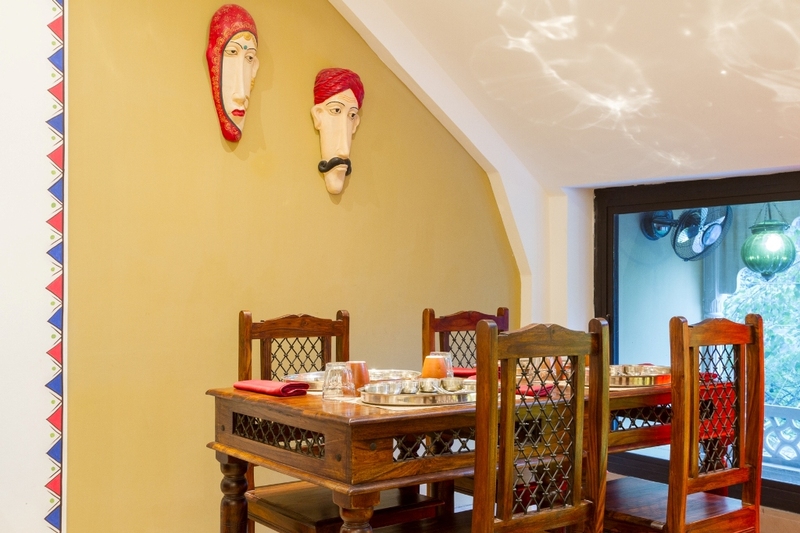 Kathputli, the recently opened Marwari restaurant ushered in 2015 in its trademark Rajasthani folk style. The true lovers of Rajasthani food and folk music witnessed it’s perfect amalgam on New Year’s eve with the Live performance by ‘The Barmer Boys’, led by Manga ‘Mangey’ Khan (vocals, harmonium) with the twin percussive punch of Rais Khan (morchang, bhapang, khartaal, beat-boxing) and Tarif Khan (dholak). 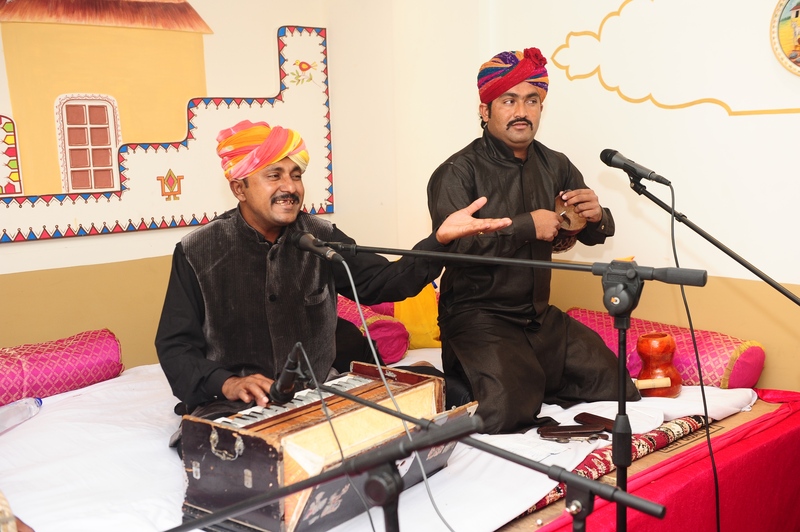 The blend of North India and Sufi music greeted the guests who enjoyed the Marwari gourmet fare at the Defence Colony Market situated restaurant. The trio’s thrilling jugalbandi and beautiful songs like, ‘Bolo toh Mitho Lage’, ‘Hum bhi Jaaney’, ‘Parosan le Gayi re’ and ‘Pir Jilani’ saw the engagement of the listeners with rhythmic claps and appreciation. The arresting melodies and Mangey’s powerful and traditional vocals gripped the audience’s attention while they relished on a scrumptious array of vegetarian delights – Rajasthani Khichdi, daal baati churma, gatta curry, Gujarati Kadi, palak thepla, chawal ki kheer and moong dal halwa. The evening earmarked a perfect harmony of soulful, spirited music of Barmer Boys with a rustic yet royal treatment from the kitchens of Kathputli. BARMER BOYS: Stars of MTV Coke Studio Season 3 and barely in their 30’s, the Barmer Boys carry forward the centuries-old musical tradition of the Manganiyars and are leading examples of Rajasthani folk and Sufi music. The band’s versatility of styles and bubbling energy infuses each performance – from soulful Sufi kalaams to uplifting wedding and celebratory songs, to boisterous jams with beat-boxing. Their debut album “At Home: Barmer Boys” was released in Dec 2012 on Amarrass Records. The group formed in 2011, and have since performed with a host of world renowned artists including Vieux Farka Toure, Bombino, BaBa ZuLa, Madou Sidiki Diabate, Rupa and the April Fishes, and The Gypsy All-Stars. They have performed across India at the Amarrass Desert Music Festival (2011, 2012), The Elders Conference, Escape Festival, Bhakti Samaroh and more. 2014 has been an exciting year for the Barmer Boys with the success of their ‘Zordaar’ debut coast-to-coast US tour, a showcase at the Borneo World Music Expo (June 14), featured at Roskilde Festival in Denmark (July 3), and at NH7 Weekender Delhi.